Tel Aviv City Stories - an Activity City Guide for Creative Travelers is a must-have item for your trip to Israel. It's a coloring & activity book, travel journal, and city guide all one. This book will be your best travel companion. Let it guide you through the city’s secret doors, hidden gems and gardens tucked away, and encourage you to explore them. All about Tel Aviv - survival guides, insider tips, to-do lists, fun facts about local culture, food, hangout spots and much more. 120 pages of original, unique illustrations for you to color in or draw around to commemorate your own personal experience. A personal travel journal - document your own experiences and tips, share your discoveries and be creative. 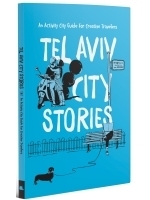 “Tel Aviv City Stories” leaves plenty of space for your drawings, pictures, notes, and stories. When you return home, this book will become a memoir of your Tel Aviv travel experience. Your vacation might be over, but the memories will last forever. Looking for more cities to explore?